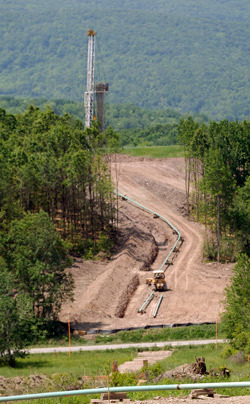 Editor’s note: This is the second installment of a three-part series on the Marcellus Shale. The third part will run in next week’s edition. Read the first part here. At first, all they really wanted were the pigs. Geologists had known for decades that the 171 acres of Bradford County land Daniel and Gayle Hershberger bought in June, 2008, also potentially sat on top of a goldmine of natural gas, if only technology existed to access it. Of course, the Hershbergers, who also own a 150-acre farm in Quarryville, weren’t ignorant of that potential; the purchase included a lease for the gas rights. They were simply far more interested in housing 4,300 hogs for what Mr. Hershberger describes as a “swine finishing unit,” but what the average person might call a pig farm. “The gas lease was just something that came along with the property, and we just accepted it as is,” he said. That all changed when gas companies took the technological know-how they had developed while harvesting gas in other parts of the country and began focusing it on the Marcellus Shale. It’s also changing Pennsylvania’s economic outlook and adding to its credibility as a clean-energy hub. The shale, which can run hundreds of feet thick more than a mile underground, stretches from New York through much Pennsylvania and into West Virginia, Ohio and Kentucky. Its potential reserves have sent gas drillers searching all over the northeast, but most are now focusing their operations in northern and western Pennsylvania. Projections estimate the technically recoverable gas in the Marcellus at 262 trillion cubic feet, more than any other shale-gas formation in the U.S. Since development of the shale is still in its early stages, the number continues to be revised upward. That alone could make Pennsylvania a significant factor in domestic gas production, but add its proximity to the world’s largest market for gas–the U.S. Northeast–and it looks highly feasible that Pennsylvania will be a main supplier for a major increase in gas usage. The U.S. Energy Information Administration reported on May 27 that it expects gas consumption to increase 44 percent worldwide by 2035. In 2008–the most recent year for which the U.S. Department of Energy’s Energy Information Administration has data –Pennsylvania ranked 15th among states that produce natural gas, marketing almost 200 billion cubic feet of gas. But that was back when just 195 wells were drilled in the Marcellus for the entire year, according to the state Department of Environmental Protection. In 2009, 768 Marcellus wells were drilled, and 364 were drilled from January through April of this year, while another 894 were permitted, the agency reported. The U.S. is already consuming more gas than it produces; half of the natural gas consumed today is produced from wells drilled within the last three-and-a-half years, according to a report from the Ground Water Protection Council. But the same report notes that shale gas production could help balance that disparity. Drilling for natural gas has been going on intermittently in New York and Pennsylvania since the first well ever was struck in 1821 near Fredonia, N.Y. 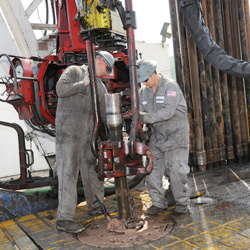 Hydraulic fracturing–a process that expands and holds spaces within rock much like a jack and jack stands do for a vehicle–has likewise been in use since the technology was developed decades ago. However, the combination of so-called “fracking” with horizontal drilling is what’s driving the current interest in producing the Marcellus shale. Horizontal drilling allows a well to run vertically straight down to the shale, then gradually arc horizontally to run parallel through the seam. Not only does it produce more gas per well by extending the so-called “pay zone,” but it allows wells to be grouped on the same pad site, reducing surface disturbances up to 90 percent over traditional well-drilling practices. Industry detractors have raised concerns about a variety of issues, fearing environmental, economic and social repercussions. They point to reports of groundwater contamination, road damage and housing rent increases as evidence the industry, as others have done in the past, is simply exploiting the Commonwealth for its resources and will leave a greater legacy of degradation than benefit. The difference between gas drilling and previous extraction industries is that drilling activity decreases over time, while the economic benefits continue. Once wells are drilled, pipelines are built and gas is flowing to market, the only disturbances noticeable to residents are the improved roadways. With the burden of past industry abuses upon them, drilling companies are taking seriously their need to be good corporate citizens. As roads became damaged throughout the in-state shale region in the spring, gas companies spent millions to maintain roads, and have announced plans to upgrade certain routes. That’s a boon for beleaguered state roadways, which recently received a D- grade from the Pennsylvania chapters of the American Society of Civil Engineers. “We are receiving significant road construction without using taxpayer dollars and are able to use our liquid fuels dollars to do other maintenance and bridge building in the area,” said state Rep. Tina Pickett, R-Towanda, at a hearing of the House Republican Policy Committee earlier this month. A recent report from the state Department of Labor’s Center for Workforce Information and Analysis suggests that indirect benefit from drilling, noting that for each job created in the industry, about 3.55 are created in the Commonwealth throughout all industries. The report also predicts that the gas industry will add almost 4,400 jobs in Pennsylvania over the next 10 years, so that increase will also lead to the creation of an additional 11,200 jobs. For every dollar of earnings created by the industry, the report adds, about $2.66 is paid out through wages and other compensation throughout the state. All of the development has been in response to and a boon for landowners like the Hershbergers, who–two years and two wells later–are considerably more interested in gas drilling. Gayle and Dan Hershberger sit on their porch of their home in Quarryvile. 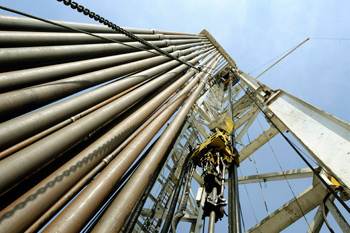 A Chesapeake Energy gas drilling pad stores three lengths of drill pipe in vertical racks during the process of lifting out sections of drill pipe from the bore. This allows for the addition of sections so they may dig deeper into the shale. Deck workers tackle the job of lifting out sections of drill pipe from the bore. 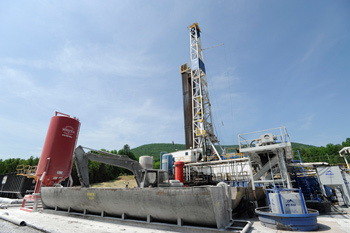 A gas drilling pad has ground storage of drill pipe mud for it’s mile-deep probes into the Marcellus Shale gas pockets.